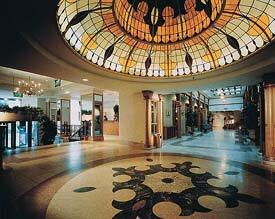 ABOVE: The lobby rotunda of the Hotel Park Plaza Victoria, which has stood near Centraal Station since 1905. Ten historic houses were joined to create the Ambassade, where the decorating scheme runs to antique furniture and chandeliers. The Beethoven is in the Oud Zuid district, a short tram ride from the city center. It's a good choice if you're looking for a pleasant, fashionable neighborhood away from the tourist crowds. The Amsterdam was built in 1911 on the Damrak, the city's main tourist thoroughfare. It's near the Dam Square, and you can easily reach the hotel on foot or via tram from Centraal Station. All 79 rooms have free Wi-Fi and soundproofed windows to keep out street noise. This first-class hotel occupies an 18th Century building behind the Royal Palace on the Dam Square. It was completely renovated in 1997 and offers 120 rooms and suites. Three generations of the same family have run the Esther�a since it began as a 12-room inn in 1942. Today, the hotel offers 71 rooms in six connected houses that face the Singel Canal and the Spuistraat. The Esther�a has free coffee, tea, and hot chocolate in the lounge, books for guests to borrow, and amenities for children. "The smallest four-star hotel in Amsterdam" has four one-bedroom suites, each with a kitchen, a dining area, free Internet, and a small computer. It occupies an Art Deco building in the Museumkwartier. This modern hotel near the Central Station is convenient to shopping and tourist attractions. Some of the 239 rooms are equipped for handicapped guests, all rooms have free-Wi Fi, and secure parking is available nearby. The Memphis has 78 rooms, all with free Wi-Fi. (Use of the business center is also free.) The hotel is located between the Amstel Canal and the Vondelpark, and an independent restaurant is on the premises. In the summer, you can eat breakfast on the garden terrace of this modern 87-room hotel in a residential district of Amsterdam. The hotel has a tennis court and a garage with free parking. The dowager queen of Amsterdam's four-star hotels is centrally located on the Damrak, with double-glazed windows to block street and tram noise from its 305 air-conditioned rooms. The railroad station and canal excursion boats are opposite the hotel, which was built in 1905. (See the lobby photo at the top of this page). Style and service are the most notable features of this hotel in Oud Zuid, on the southern edge of the Vondelpark. The hotel has a wine bar with a terrace, and free Wi-fi is available in all 138 attractively-decorated rooms. The Sir Albert is a boutique "design hotel" next to the Museumkwartier, about 600 meters from the Rijsmuseum, the Van Gogh Museum, and the Diamond Museum. Rates include Wi-Fi, and you can borrow an iPad from the desk. The Vondel has 86 rooms and a patio where breakfast is served in nice weather. Its attractive building is near the Vondelpark, within easy walking distance of the Film Museum and the Rijksmuseum. The railroad station is 3 km (2 miles) away.